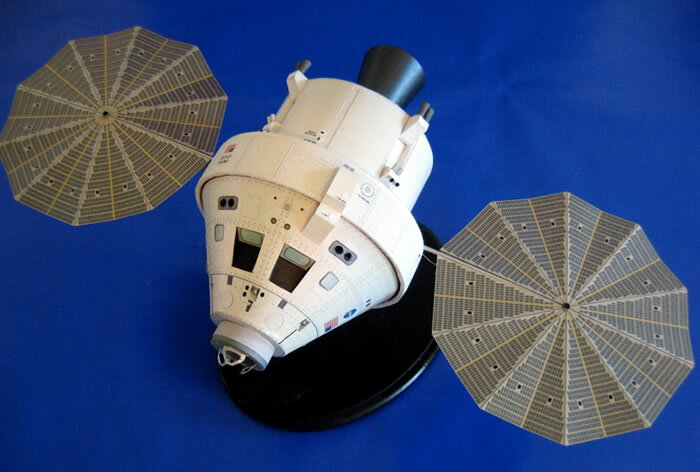 Here is my 1/48 scale Orion spacecraft, modeled in card. 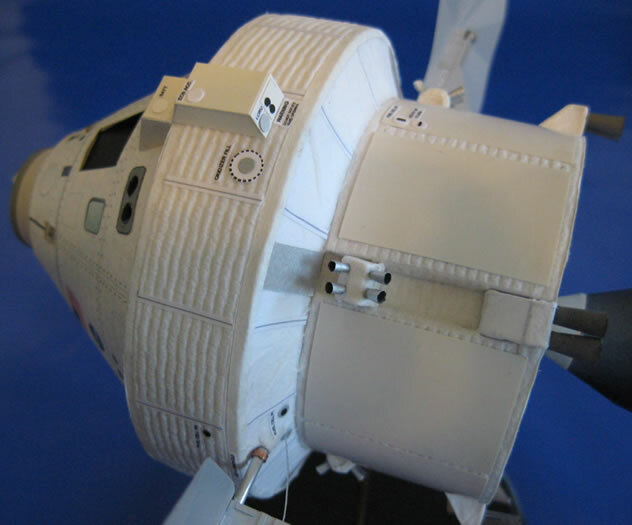 I enlarged parts from Ton Noteboom's 1/96 scale Orion as templates for my own, but Ton did enlarge the Crew Module for me. 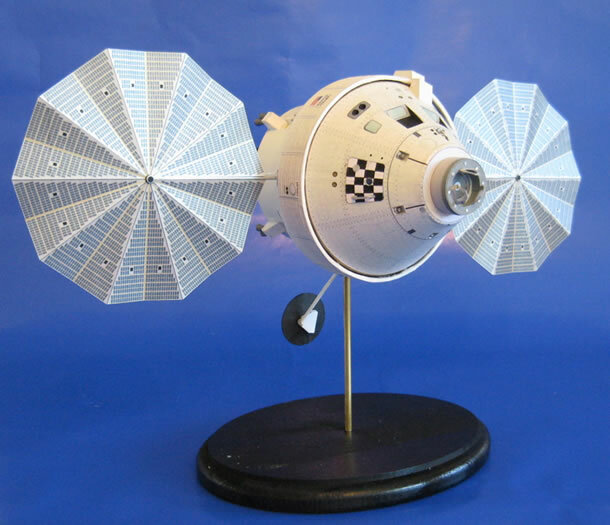 Virtually all of the detail is scratchbuilt, and the model represents the latest iteration of the troubled Orion program. 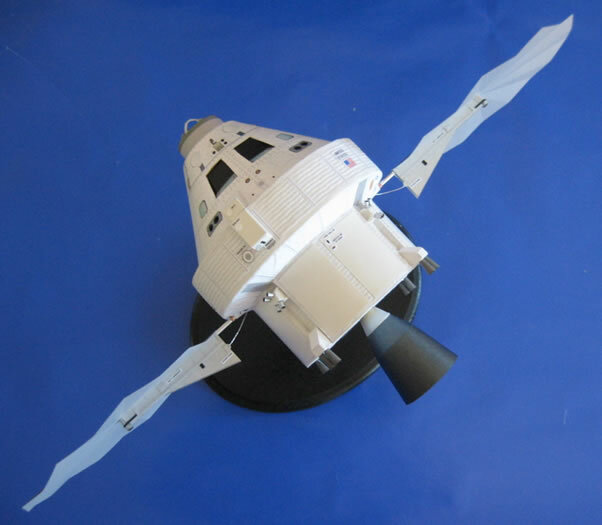 While most early artist renderings of Orion show it with a grayish Service Module, after discussing the matter on some "real space" discussion boards populated by real rocket scientists, I came to the conclusion that there's every possibility that if Orion is actually built, the SM will be covered with thermal insulation blankets, ala the European Space Agency's Automated Transfer Vehicles. The current design has the SM covered by a shroud at launch, so none of it would be exposed to the elements on the pad. To replicate the insulation blankets, I used two different types of toilet paper (Cottonelle for the ridged sections and Northern for the smooth) as well as some textured art paper I have. The toilet paper was stiffened with a 50-50 mix of white glue and water. The lower portion of the SM also has eight large radiator panels, which I modeled in white poster board. I scratchbuilt the Low Impact Docking System and much of the details on the UltraFlex Solar Arrays. 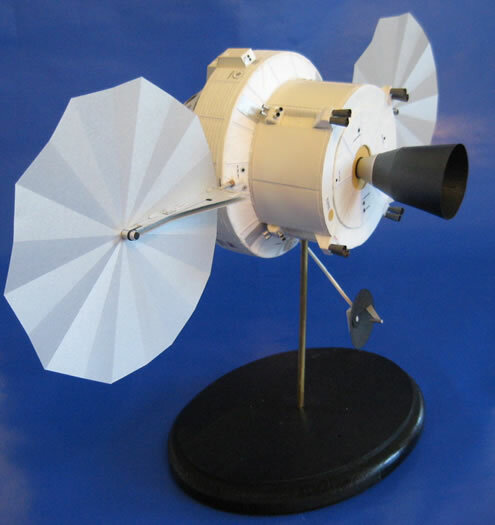 The only non-paper portions of the model are aluminum tubes used for the arms of the UFSAs. Everything else is paper of some sort. I also used three different types of metallic paper. 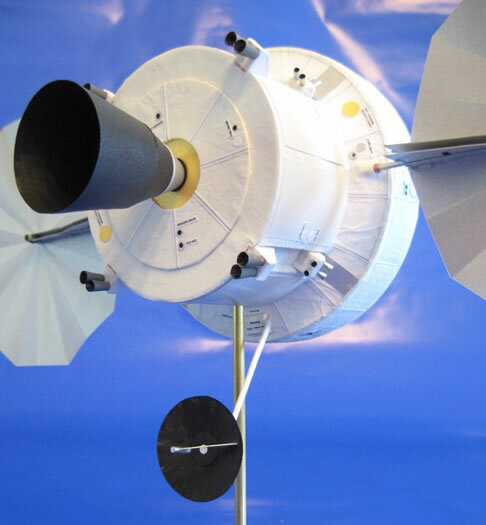 As I mentioned, this is the current iteration of Orion, where the upper portion of the SM has a much larger diameter than the base of the CM; the CM appears as though it is being devoured by the SM. But that's how it looks.